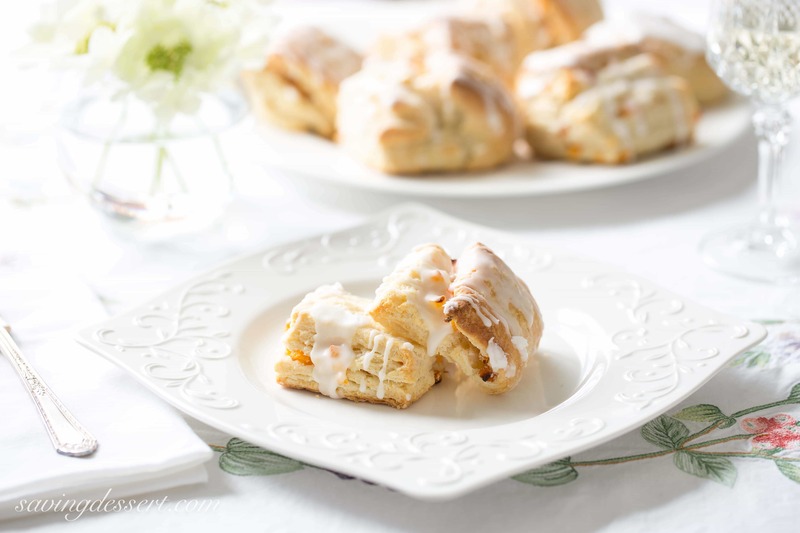 Apricot Scones – Light, flaky, buttery scones layered with chopped apricots and iced with an almond flavored glaze. Light and buttery, flaky and soft, these are absolutely wonderful scones. It was love at first bite for me and I feel certain these will make any mom swoon over brunch. 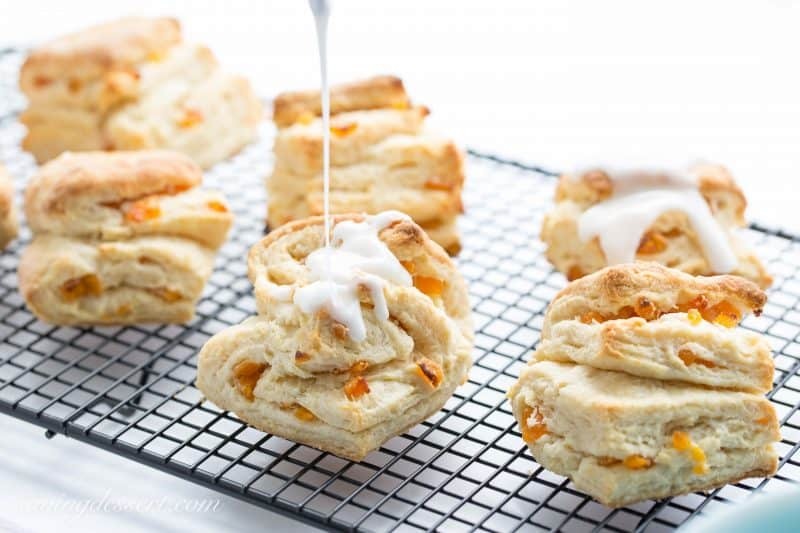 This Buttery Apricot Scone Recipe is so easy to make – even non-bakers can make this happen. Remember those flaky canned biscuits? 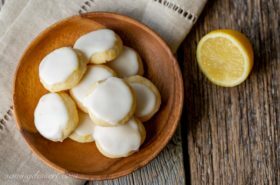 These come apart in soft, lightly sweet layers just like the old canned biscuits, but taste so much better! Whisk together the flour and baking powder. In a 2 cup measure combine the granulated sugar, milk and salt, stir to dissolve. Cut in ice cold butter until pea-size pieces form then add the milk. Stir with a fork until the dough comes together. Roll the dough out on a lightly floured work surface and spread on 2 tablespoons softened butter. 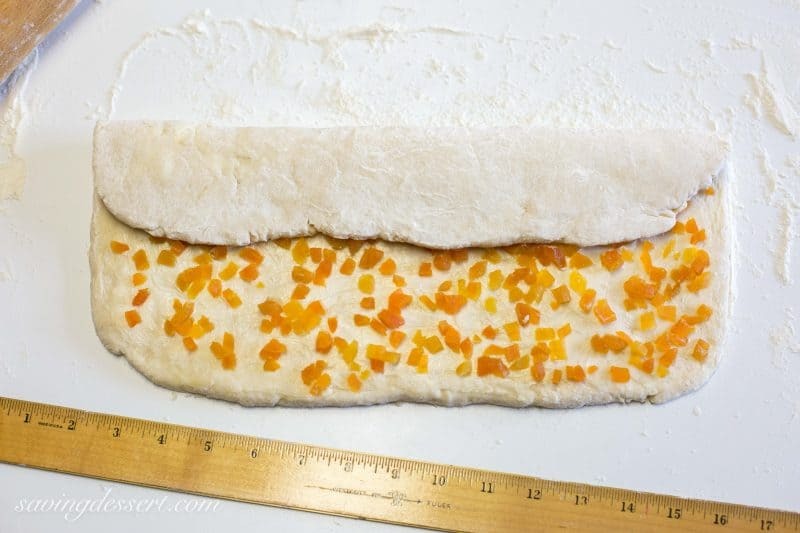 Sprinkle chopped dried apricots evenly over the dough. Fold the dough like an envelope, in thirds. 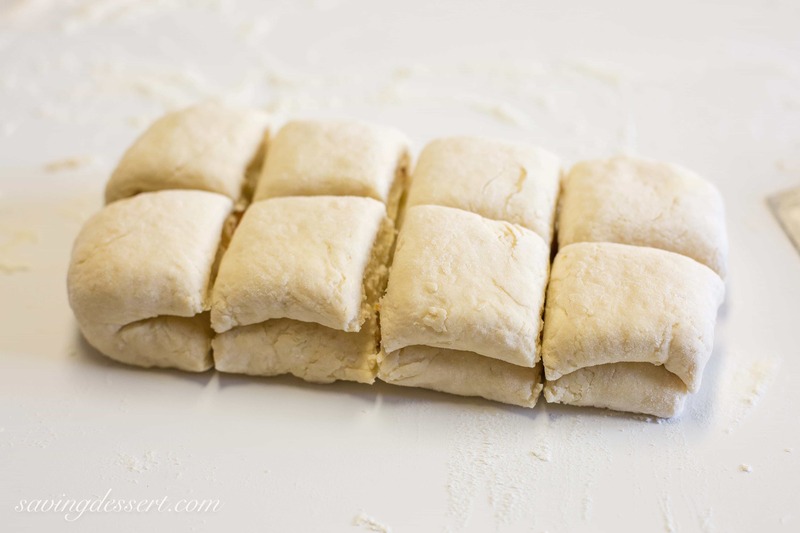 Fold the dough in half crosswise, press together and gently flatten into an 8×4″ rectangle. Cut the dough into 8 equal pieces and bake! 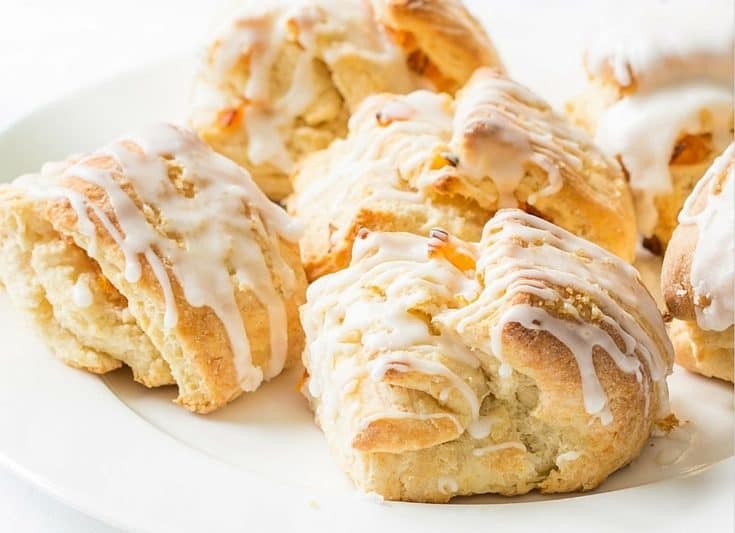 Brush the fresh baked scones with butter or drizzle with a simple icing flavored with almond extract. Layers and layers of sweet apricots and buttery goodness! This is a wonderful splurge and totally worth all the broccoli and salads I ate all week! 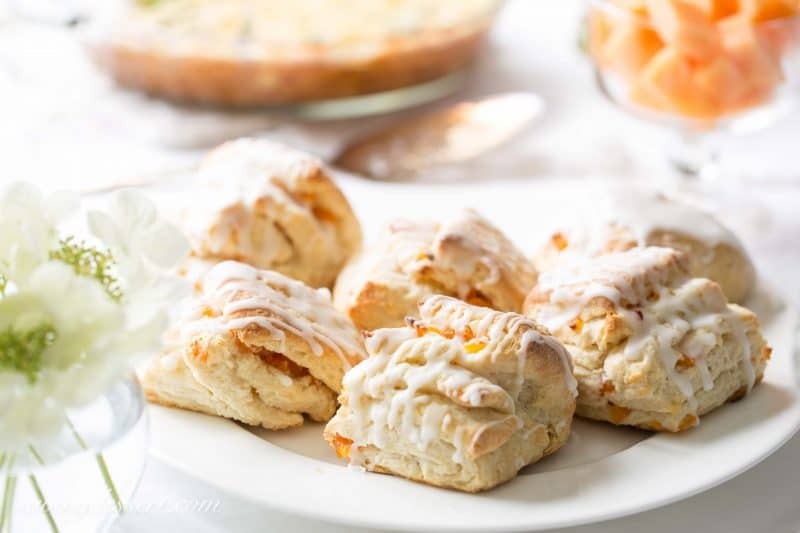 I hope you’ll make these apricot scones as part of your mother’s day celebration. Don’t forget our terrific Crustless Asparagus Cheese Pie to round out a wonderful brunch. A light, flaky, buttery scone layered with chopped apricots and iced with an almond flavored glaze. In a two cup measure combine the milk, sugar, and salt. Whisk until dissolved. Set aside. In a large mixing bowl whisk together the flour and baking powder. Cut 10 tablespoons of the cold butter into 1/2" pieces. Add the butter to the flour mixture and blend using a pastry cutter until pea size pieces remain. Add the milk and stir with a fork until the dough starts to come together. Lightly flour a clean work surface and gently roll the dough out into a 14x8" rectangle. Soften the remaining 2 tablespoons of butter in the microwave and using your fingers, spread the butter evenly over the surface of the dough. 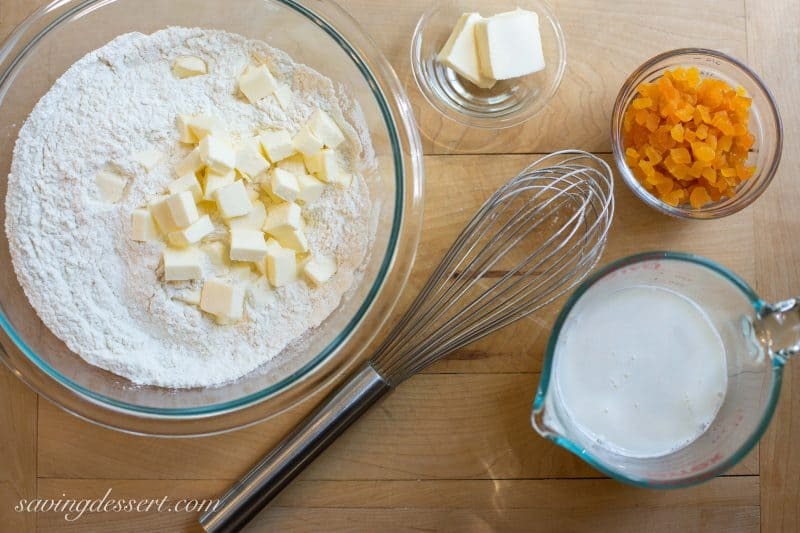 Sprinkle the chopped apricots over the dough and gently press so they stick. With the long side of the dough facing you, fold the top 1/3 of the dough over the center. Fold the remaining 1/3 over the top portion, like folding a letter. 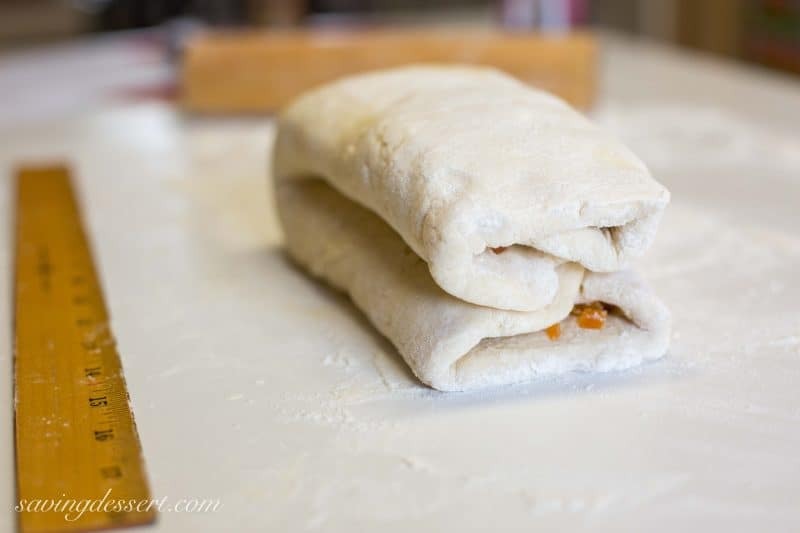 Fold the dough in half, then using the rolling pin, gently flatten to an 8x4" rectangle. Cut the dough in half lengthwise, and then into quarters crosswise to make 8 even squares. Bake on the parchment lined baking sheet for 25 to 30 minutes or until lightly browned. Remove to a rack to cool slightly before icing. To prepare the glaze combine the confectioners sugar, almond extract and water in a small mixing bowl. Whisk until smooth. Drizzle over scones and serve. For all you moms out there – have a wonderful Mother’s Day – whether it’s with your mom, or your children, or that special woman in your life. Being a mom has to be the best job in the whole world. Thanks so much for stopping by! Tasted really good. I like that the dough baked up crunchy outside and soft inside. One cup of milk was not enough to get the dough to hold together. I added a bit more, but still hard to roll out. I think i would add the chopped apricots to the mixture before forming it. The almond glaze was really good with this. Thanks for the feedback Lori and for trying this recipe. Great tip about adding the apricots to the dough. Happy baking and thanks again. I found your recipe for these scones on Pinterest. I just had to make them immediately. But all I had was apricot preserves. So off I went and made them. They were awesone…I think the best scones I have made so far. I loved your technique for making these scones. Think I might try a different preserve next time…something on the thick side. Thanks again! P.S. My Shih Tzu loved them too! ???? How awesome Elaine! I love that you used preserves – that added sweetness must be great. Thanks for giving it a try and for the feedback! Ooo, Tricia, I love the way you fold them before baking – love that idea. Have printed your recipe and will have to invite friends over for tea soon. You have some interesting tea to serve your guests Mandy – hope you love the scones! Oh my Goodness, these look AMAZING! You know how sometimes, on Pinterest or on a blog or print magazine (how retro! ), you see a food image that stops you in your tracks? Your top photo did that to me. Everything about this post made me say, “WOW!” ….the photos….the recipe….the works. 🙂 Thank you for sharing this! I know I will be making these scones over and over again. Oh Tricia, now I know what’s on my wish list for Mother’s Day . I must try these fantastic scones, they look truly irresistible. You too Daniela! Hope you are doing well. What a wonderful recipe for breakfast or brunch! Wish I’d seen them in time for today! Father’s Day is coming up Beth – maybe a little cinnamon and sugar would do the trick! Hope you had a lovely Mother’s Day! I think many of us will be trying this method, Tricia! They look absolutely irresistible and I’m in love with the folding technique. So many possibilities 🙂 Thank you for such a wonderful recipe! Happy Mother’s Day to you. 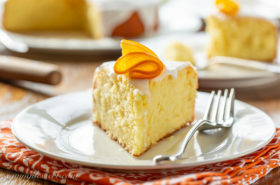 Thanks Susan – buttery layers are so hard to resist! Happy Mother’s Day! Thanks Betty – What a wonderful brother to share his fresh asparagus with you. We just love it. Lingering is good 🙂 Hope you’re having a fun “end of school” roundup! Happy Mother’s Day! That first picture alone made my mouth start watering! 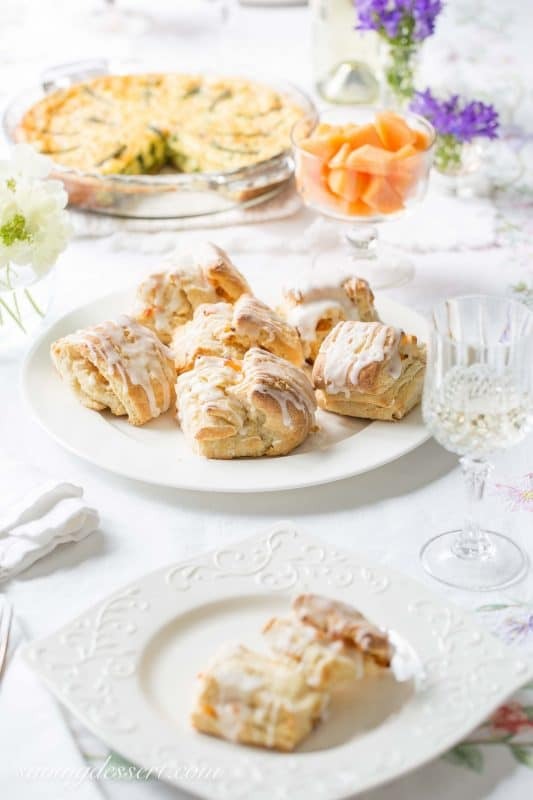 I am making a Mother’s Day brunch – these will be on the menu! They look fantastic! Thanks Chris – have a wonderful Mother’s Day! Happy Mothers Day and thank you! Thanks Monique – they are tasty. Have a wonderful Mother’s Day! Thanks so much Becky. Hope you are doing great. I also hope you have a fantastic Mother’s Day! Take care and thanks so much for stopping by. These look perfect. I have not seen scones folded in this manner. Interesting! 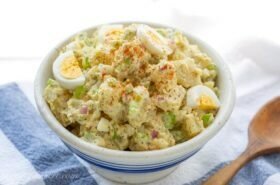 I will be giving this a try, maybe for Mother’s Day Brunch. Can these be prepared in advance? 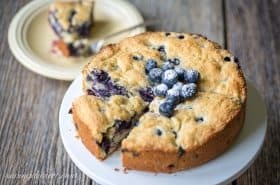 I have not tried making them ahead, but the original recipe noted: “Rolled and cut scone dough can be frozen in an airtight container up to 2 days. Bake directly from the freezer, increasing baking time as needed. Scones can be made 6 hours ahead-let cool completely and store in an airtight container at room temperature.” We refrigerated our left over scones (if you can believe there were any left over!) and reheated in the microwave for 30 seconds before eating. They kept well for 5 days and still tasted wonderful. Thanks! Have a happy Mother’s Day! These look so flaky and delicious! I love that new technique..must try it next time when I make scones. Thanks Angie – anything with butter in the middle just has to be good! Happy Mother’s Day! 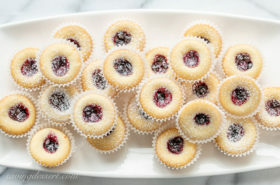 I can hardly stop myself from putting down my coffee and running to the kitchen to make these! 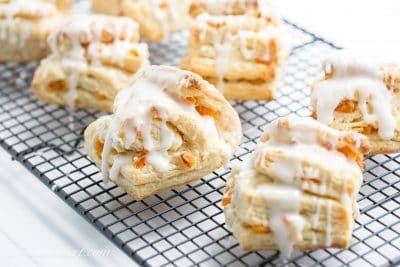 I really love scones, and this new method is going to haunt me until I try it. Those layers! So sorry – don’t you just hate that! I can’t wait to see what you come up with! Happy Mother’s Day Sue! Oh Tricia – these look fantastic! I love that fold-over technique…gotta try that! These flavors make me think of Italian rainbow cookies, which are one of my favorite things. The butteriness with apricot and that almond glaze are all so good together. A chocolate glaze could work for me, too! ; ) Hope you have a wonderful Mother’s Day weekend! You will love them Monica – I was thinking about a little brown sugar cinnamon thing for the middle – they will be almost like cinnamon rolls without yeast – more like a cinnamon roll biscuit. Yummmmmmm Happy Mother’s Day to you! Oooooooh! LOVE at first sight! Scones (or any biscuit-like creation) are my biggest weakness! And apricots. Tricia, I think you tempted me right off my diet – wagon. These are like the best biscuits ever Tanna! I really ate salads, asparagus and broccoli all week so this was a real treat! I’m a mom, I deserve that something special … somebody should tell that to my waistline!